Ratón proves that you can’t keep a good balloon rally down. Festivities Ripley Park, Shuler Theater, Old Pass Art Gallery, and the 11 a.m. Fourth of July parade are along First and Second Streets in the Ratón Downtown Historic District. Eat After the balloons land, join the crowd for the breakfast buffet at All Seasons Restaurant (1616 Cedar St.; 575-445-9889; allseasonsnm.net). WHEN TWO DOZEN BIG, bright balloons rise over Ratón on the Fourth of July, it’ll be a 20th anniversary that almost didn’t fly. The 2011 Track Fire burned 27,000 acres along the town’s northern edge, abruptly shutting down Ratón’s annual balloon rally as the launch site was turned into a staging center by firefighting crews. Grounded, the rally didn’t return in 2012. But last year, race director Christine Valentini and founding volunteer Kathy McQueary mobilized the city’s resources and triumphantly relaunched the International Santa Fe Trail Balloon Rally. Sponsored by Ratón MainStreet, this year’s festive All-American Weekend on the Santa Fe Trail, July 4–6, will feature a boisterous downtown parade ending at Ripley Park, site of the Arts & Crafts & Fun Fair that will include live music at the gazebo Friday and Saturday. Other weekend events include a holiday production at Ratón’s magnificent Shuler Theater, a balloon-themed art show at the city’s Old Pass Art Gallery, and a fireworks extravaganza at dusk on the fourth. The downtown fireworks will light up the sky beyond the center-field fence at Gabriele Field after the Ratón Osos play the Trinidad Triggers in a Pecos League professional baseball game that starts at 6 p.m. The star of the show all three days, though, will be the balloon rally at La Mesa Airfield, on the southwest edge of town. A pancake breakfast, held each morning at 5:30, will be accompanied by a DJ/announcer who, at 6:15, will broadcast the morning’s pilots’ meeting. As soon as the sunrise breezes settle after 6:30, balloonmeister Royce Miller will signal the mass ascension of this year’s 24 invited pilots and their balloons. Pilots love Ratón for the same reasons they love Albuquerque: beautiful vistas, mesas, and the unique “box effect” of the mountains. Ratón pilots can often control their paths by changing altitude, taking advantage of crosswinds produced by the mountains that tightly hug the town. Royce Miller’s flying experience in his native Guymon, Oklahoma, is more typical: Once he takes up his Green Hornet balloon, it blows straight out of town. Ratón’s rally began in 1994 with an 18-year-old’s wish. Californian Jarrod Giacomo had multiple sclerosis, but he dreamed of floating above the earth in a hot-air balloon. The best his family could find for him in California was a tethered ride for $400. Giacomo spent the summers with his grandmother in Ratón, where his uncle, Chuck Henry, arranged for him to take a balloon ride with an Albuquerque pilot friend, Bruce Hale. Giacomo was unable to travel to Albuquerque, so Hale brought his balloon to Ratón. 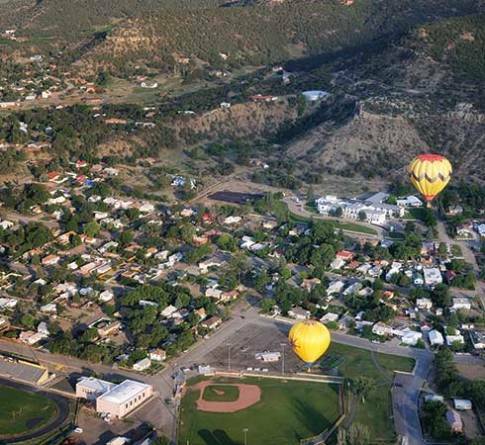 This year’s balloon rally is a great reason to beat the sunrise to Ratón for the Fourth of July weekend.